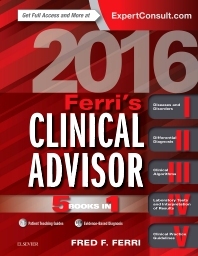 Ferri’s Clinical Advisor 2016 is simply the fastest, most effective way to access up-to-date diagnostic and treatment information on more than 700 common medical conditions. The popular "5 books in 1" format provides quick guidance on diseases and disorders, differential diagnoses, medical algorithms, laboratory tests, and clinical practice guidelines. Yearly updates by experts in key clinical fields ensure that you’re current with fast-changing medical knowledge, and extra electronic content delivers more than 100 exclusive topics, additional algorithms, and much more. Dr. Ferri is a Clinical Professor of Community Health at the Alpert Medical School, Brown University and author of over 30 medical books. He has been the best selling medical author in the United States over the past 25 years and is also well known and respected internationally. He has been a visiting Professor at other medical schools and many of his books have been translated in several languages. In addition to his numerous publications, he has had a distinguished academic career at Brown University where he has received several awards for his dedication to teaching including the Brown University Excellence in Teaching award and Dean’s teaching Award, and with the American College of Physicians where he was inducted as a Fellow in the ACP and has been a recipient of the Irving Addison Beck Award from the Rhode Island Chapter of the American College of Physicians.